The 28.96 metre motor yacht Eleonora II, listed for sale by Dean Anthony at Allied Marine, has been sold with Peter Markatos at HMY Yacht Sales introducing the buyer. Built in GRP by UK yard Princess, Eleonora II was delivered in 2011 as a very highly specified Princess 95’ model. A warm interior featuring book matched high gloss walnut paneling accommodates eight guests in four cabins consisting of a master suite, VIP suite and port and starboard twins, all with entertainment centres, Samsung television screens and en suite bathroom facilities. The lounge area in the saloon has a U-shaped settee, coffee table and an entertainment centre including a Kawai electric piano while forward in the dining area is guest seating for eight around a high gloss table and there are storage cabinets for glassware, china and silver. The aft deck is particularly suited to leisurely al fresco dining and cocktails, with U-shaped seating at a teak table, a full bar and a large Samsung flat screen television. Up on the flybridge is a second helm position, two upholstered seating areas, a teak table, a bar with an ice maker and a 50 inch flat screen television. The crowning glory here is a motorized sun roof to protect guests from the heat. More sunbathing is available on the foredeck, fitted with a lounging area including adjustable back rests. 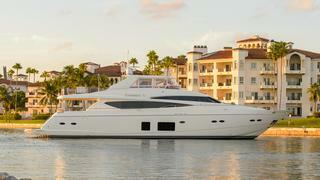 Twin 2,650hp MTU diesel engines give her a cruising speed of 24 knots. Lying in Miami, Florida, Eleonora II was asking $4,997,777.